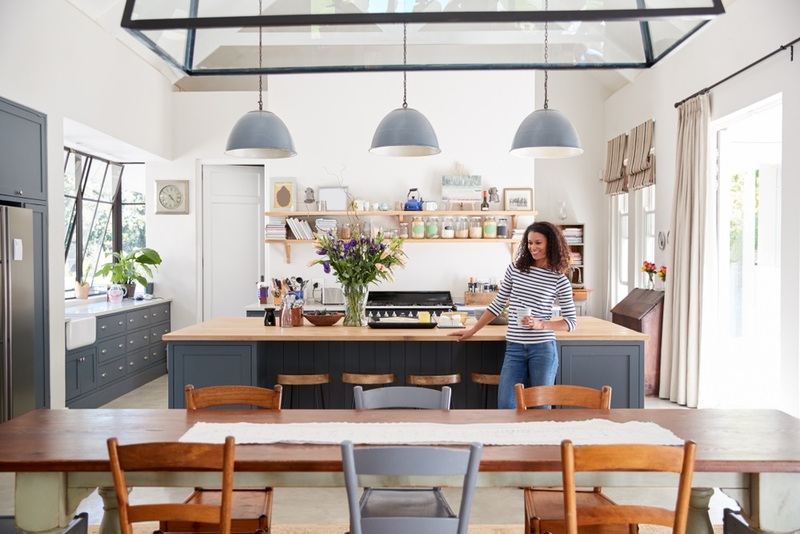 Learn architectural tricks that will enhance open-plan spaces every time. 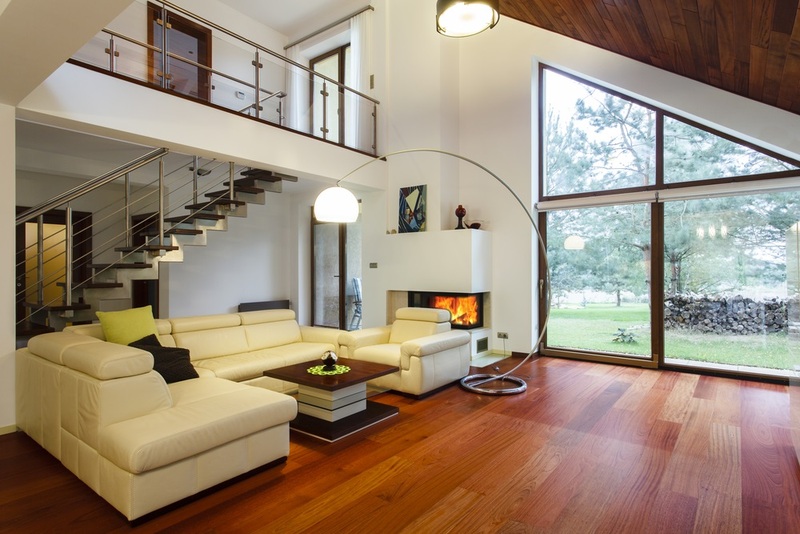 Open-plan living spaces must not feel dull, flat, and soulless. It needs to look unified and zoned at the same time. Zoning makes an open-plan space not just functional but comfortable for the people using it too. 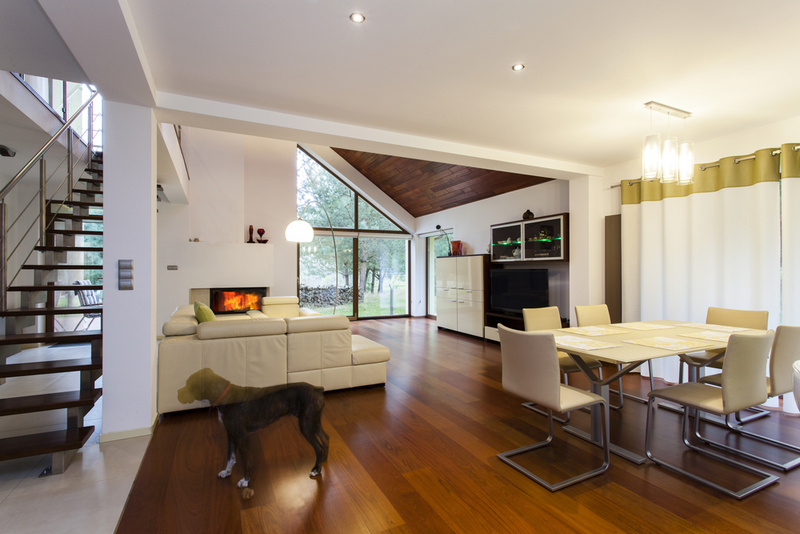 The open-plan living format is flexible. You can engineer it to establish a clearer relationship between spaces. Changing factors like floor level, floor finish, ceiling height, building material, colour scheme, furniture arrangement etc., emphasise the degree of separation and integration. Take a look at this sunken living room. Notice how the change in floor level separated the main seating area from the rest of the space. The stairs and the accent LED lighting give you a sense of entering a different zone… A cozy area sitting between the kitchen, dining area, and the ocean view. 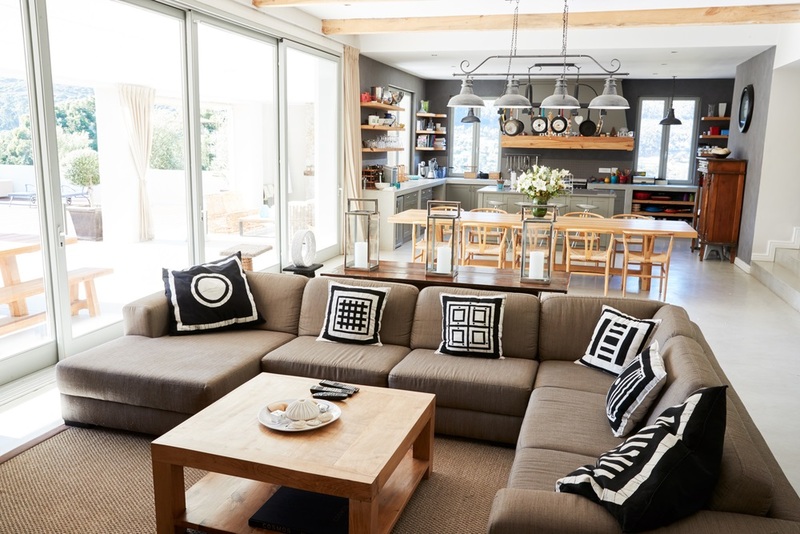 Layering an open-plan interior is one way to separate areas in an open-plan space. Building in layers means you design areas individually then you pull them together to form a cohesive look. It’s a strategy to add depth and character to the room. Check out the featured home interior below. It’s eclectic and you see the layers of design elements very well. Notice how established each area is and how they come together in this modern farmhouse interiors. Make your chosen colour and material palette work for you. In this open-plan area, the designers used two kinds of flooring to separate the main areas. Meanwhile, the homogenous colour and material palette unified the space. There are a lot more ways to create a clear visual separation between each area in an open plan space. Strategies like using different furniture colours, having two-toned walls, and arranging furniture pieces work. We discussed these in detail in a previous blog. Have you ever seen a part of your house get illuminated with the soft morning light? If you have, then you know how heavenly that looks and feels like. Daylight is an amazing highlighter. The right amount of sunshine magnifies the space and makes it more inviting and intimate. Too much of it feels overwhelming as it bleaches everything out. In this home, a little bit of morning sun hits the dining area, as if it’s inviting you to sit, drink coffee, and eat breakfast. The rays of sunshine also give this intimate dining area a greater depth. 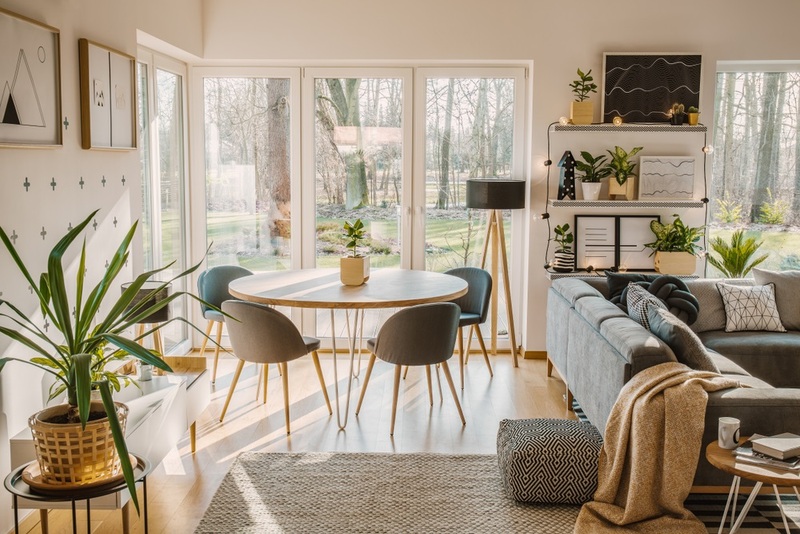 When designing your home interiors, think about how natural light hits every part of your home. Consider the angle from which the light comes in and how it enhances the space. In this luxury forest home, the designers used massive glazed walls to illuminate most parts of the house. 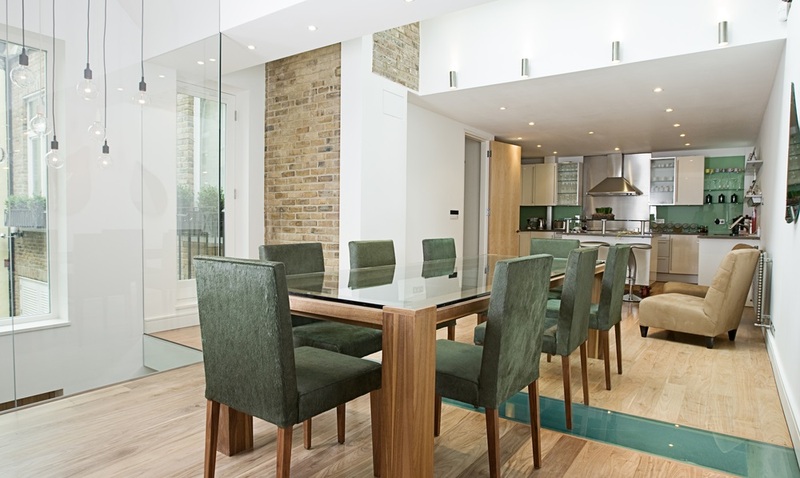 This design invites more daylight in and further into the dining area. As a result, you need less artificial lighting. Another way to enhance an open-plan living space is to check whether you can see the space from different viewpoints in the house. Openness is the beauty of an open-plan space. Look at this luxury forest home again. It features a living area which you can see from the dining area, the stairs, or the loft. Being able to see it when you come in, come up, and again from the gallery or landing above truly makes it the heart of the home. When you put an island in an open-plan living space, it divides the area and gives the kitchen its dedicated space. It’s a straightforward design solution, which is why many homeowners embrace it. In this apartment, you know where the kitchen starts thanks to the island. If there’s a visitor who wants to help with the cooking, they will go to the busy part of the kitchen and help you out. Otherwise, they will stay anywhere in the living or dining area. Zoning is essential, but it’s more important to blur the boundaries of each zones. That’s the beauty of open-plan spaces. It’s a space that’s united and divided at the same time. In this featured home, you can see two lounge chairs between the kitchen and dining area. It serves two purposes. First, it separates the kitchen and dining areas which have similar colour schemes. Second, it’s where the homeowner rests while waiting for the food to cook. It’s the comfortable place to sit; not too high like the bar stools and not too far like the dining table. Also, the kitchen is on the second floor. Nobody wants to tire themselves climbing a flight of stairs a few times in the next hour. Find the best architects in Brisbane.